Pleasanton is a city in Alameda County, California, incorporated in 1894. It is a suburb in the San Francisco Bay Area located about 25 miles (40 km) east of Oakland, and 6 miles (9.7 km) west of Livermore. The population was 70,285 at the 2010 census. In 2005 and 2007, Pleasanton was ranked the wealthiest middle-sized city in the United States by the Census Bureau.Pleasanton is home to the headquarters of Safeway, Workday, Ellie Mae, Roche Molecular Diagnostics, Blackhawk Network Holdings, and Veeva Systems. Other major employers include Kaiser Permanente, Oracle, Nordstrom and Macy’s.Although Oakland is the Alameda County seat, a few county offices and a courthouse are located in Pleasanton. The Alameda County Fairgrounds are located in Pleasanton, where the county fair is held during the last week of June and the first week of July. Pleasanton Ridge Regional Park is located on the west side of town. 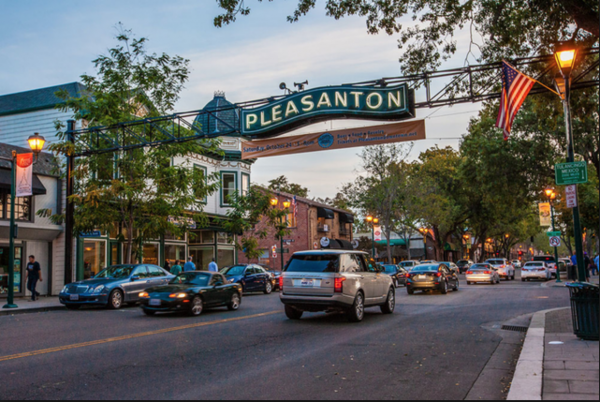 Pleasanton was ranked number 4 in USA Today’s list of “America’s 50 best cities to live in” in 2014, number 63 in Money’s list of “The Best Places to Live” in 2010, and was named one of “Americans’ Top Hometown Spots” in the United States in 2009 by Forbes. Pleasanton was named the third wealthiest city in terms of earnings in the United States by NerdWallet in 2013 and 2016.